These are not my hands :), they belong to my sister Shana. Last year around this time, I was heading to NYCC and suddenly noticed that my nails were all about a half-inch long!! If you knew my nail history ;), you’d be as shocked as I was! You see, although I’ve never had a problem with achieving relatively long hair, I could never “grow” long nails, especially on all ten digits at the same time (I’ve always had this theory that the keratin strength either goes to your hair or your nails, rarely both!). I’ve never had the patience for manicures, nail treatments or tips, especially given the need to regularly maintain them. On the rare occasions that I did get a mani, no matter how long I seemed to wait for my nails to dry, I always smudged and/or chipped one (or several) within hours of leaving the salon. So, I was ecstatic last Spring when I learned of this new Opi nail lacquer which would be completely dry within minutes and would last for two weeks with a nearly chip proof finish! I proceeded to get my nails done every four weeks (because it lasted that long) for several months. And, my nails grew! But then, the side effects began to manifest. The removal process, which involved heavy-duty chemical solvents and a “chisel,” eventually damaged my nails so badly that one thumbnail looked like a shattered windshield! For months, my nails would bend backwards when I attempted to do anything and the tips would just peel away. Henna can be used to add strength to nails because it contains a resinous substance that adheres to the surface of the nails. This provides protection from splits, chips and tears. Simply combine one tablespoon of natural colored henna with one and a half tablespoons of water. With a knife or spatula coat each nail in the mix for around five minutes before rinsing off. Only use once a month to prevent a build up of resin. I then found this post on ehow.com, which provides step by step instructions on How to Make a Nail Strengthening Treatment from henna. Both of these posts reference neutral/natural colored henna, which isn’t henna at all. Rather, it is cassia obovata as many of us on the natural hair circuit know;). However, both my sister and I experienced improved nail health via the rinsing process while doing regular (weekly/bi-weekly) treatments with real henna! As cassia can be difficult to come by on the ground, you may choose to try a BAQ henna “rinse” instead. If you don’t mind a slight orange tint for a few days, simply allow your nails to soak in dye released henna water for a few minutes and rinse. Another option is to mix a henna paste and apply it immediately, prior to dye release, and again rinse after a few minutes. However, I would expect that the strengthening of the latter technique is less than the former as the dye molecule in henna is what binds to keratin and, I assume, provides the most plant resin. If you are not feeling orange nails (hey, it’s October, they’d be great for Halloween;), you probably do want to go with cassia. I’ve experimented with the Light Mountain Hair Color & Conditioner, Neutral as it contains cassia and I could find it on the ground at Whole Foods. The ingredients are listed as cassia auriculata leaf and lawsonia inermis leaf powder and not cassia obovata though. It seems to work okay, but not as well as good, old-fashioned henna. Regardless of which option you choose, if you are in search of a nail strengthening product, BAQ henna is an effective, 100% natural, quick and easy alternative to expensive, chemical-laden and/or time intensive commercial treatments. It could be just what the nail doctor ordered! Have you experienced improved nail strength and increased length since using henna? So you applly the henna without gloves? Does it stain your hands for long? I agree with your theory on keratin going to either your hair or your nails. 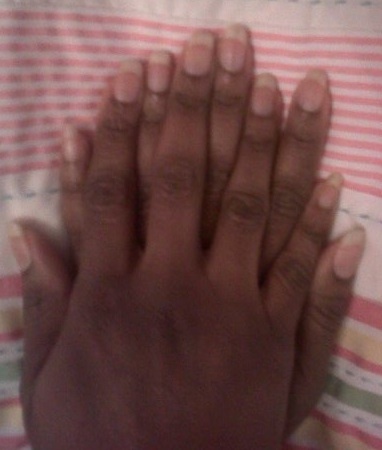 I have no problem growing my hair long, but these nails of mine are just stubborn. I’ve been thinking about henna, but I saw that they recommend using gloves for henna because it can stain your hands. How bad does it stain your hands and how long before it goes away? I don’t care if my nails get stained because I would just be painting over them anyway. the strength of the stain depends on how long the henna paste is in contact with your skin and the dye content of the henna. I applied henna (with gloves on) on monday. i rinsed out my hair without gloves. My hands are fine but my nails still have an orange tint. this has happened before and they were fine a week later. maybe my nails are stronger? i haven’t had any growth or strength issues so i can’t really say. CJ, I do like Ky. I apply with gloves, then I dunk in a tub full of water to release the majority of the henna with gloves as well. But then, when I’m doing my rounds of conditioner rinsing (usually 2-3x), I don’t wear gloves. That’s what leaves my nails tinted but my hands fine, exactly like Ky described. Okay, thanks. Good thing I didn’t try to apply the henna with bare hands. I have a feeling I would have a stained hands for a little while. I just ordered my henna today, and I can’t wait to put it on my hair. Did not the nail strength also begin with the taking of MSN? Personally, my nails are more solid and grow more quickly since I take this product. Other side effect : I have to remove “unwanted” hair more often ! I planned my first session of henna and katam (or buxus) for next Saturday. I feel anxious and excited at the same time. In fact, I am especially afraid of having many knots after the rinse !!! Shelli, Thanks a lot for your post, yesterday, on your routine : it particularly encouraged me. Trial and error (which is not in my education) are so necessary to know how to do well. Your French reader (but maybe we are several ?) still transitionning (9 months post). sorry for my english 😦 routine = regimen…. No need for apologies:)! Routine and regimen are interchangeable and I use both:)! And you are so very welcome. As to the nail strength and MSM … I wasn’t taking MSM last year. I only started using it this year, around April or May I think. So, it was definitely the henna. In fact, now that I only henna once a month (rather than weekly/bi-weekly like I was last year), they are not as strong and still tend to never all be the same length. I always mean to do the treatments, but never get around to them, so I’m only getting the henna on them one time a month:). But, my sister who was using henna every couple of weeks had the same results that I did last year when I was using henna at the same frequency. Her nails would get long, but again, never all at the same time. And, like me, we both felt like the minute they were all long, the same length and we noticed them, one would break! But, with the regular henna, the strength seems improved and the likelihood of even nails with a nice length is higher.